It's very common that, after pushing a given branch upstream, I'll want to visit it on github and create a pull request. I'm starting to get annoyed at having to manually visit the repo, find the branch, and create the PR. Q: How can I write a command that visits the PR url in a browser? The PR url is given by https://github.com/ORIGIN-REPO/compare/BRANCH-NAME. Since both the origin and the branch-name known by Magit (and by plain git), it should be easy to write a command that builds that URL and calls browse-url on it. Unfortunately, I know nothing about the internals workings of Magit, so I don't know how to get that information. to the current branch. Uses Magit." 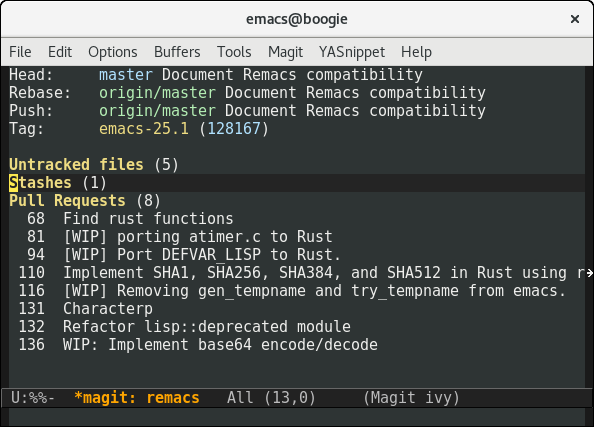 magit.el is pretty easy to read, by the way. Malabarba has posted his approach on his blog. By the way, I intend to add similar functionality (and a lot more ;-) to Magit itself, eventually. It doesn't let you view the pull request of the current branch, but it gives you a full list of pull requests which you can visit by pressing RET. Note this requires hub 2.2.